Our seventeenth profile is of a little guy named Dalton. Dalton Reese Benson was born on May 22nd 2008 at exactly 24 weeks. Mom Jo had premature rupture of membranes which was the reason for the early arrival for little Dalton. At birth, Dalton weighed 1lb 11oz. Dalton was born in Port Arthur, Texas by Emergency C-Section. He did try to breathe on his own, but was unable to maintain. He was placed on a ventilator shortly after birth, and then flown by helicopter to Children’s Memorial Hermann in Houston, Texas. He was placed in a Level 1 NICU where he spent 4 1/2 months fighting for life. During his time in the NICU he had bleeding in his brain-Grade II Intraventricular Hemorrhage. (This is common in micro preemies due to their immature brain.) He suffered mild Post Hemorrhagic Hydrocephalus that resolved on its own and did not require surgery. He had an Intestinal Perforation at one week of life as a result of low blood pressure and lost a lot of small intestine and part of his colon as a result. Dalton was overwhelmingly septic from the rupture of his bowels. The Surgeon and his attending doctors said that he had four tablespoons of stool inside of his abdomen and he was critical. Mom was told he would not make it through the night, “prepare for the worst”. He did however surprise the doctors with his amazing recovery after large amounts of antibiotics and three other surgeries. Dalton was kept alive with IV nutrition and did not receive his first feed of breast milk until he was a month old. He was on a ventilator for six weeks because of his premature lungs, and had severe Apnea of Prematurity, and Bradycardia (a scary condition where a premature baby’s’ heart rate drops and they lose oxygen saturation). He had to be resuscitated at least 5 times on a good day. 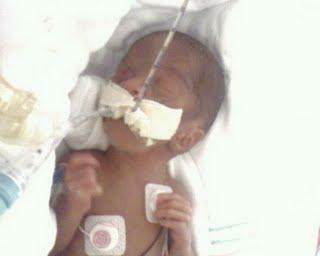 He was transitioned from the ventilator to a C-PAP, and then to a nasal cannula. He had a Patent Ductus Arteriosis “PDA” (an open blood vessel in the heart that is supposed to close shortly after birth). Dalton was monitored closely because of his PDA, but it resolved on its own and did not require treatment. While in the NICU, Dalton’s vision and hearing were tested and found to be ok. He took well to a bottle and was discharged without oxygen or any medications. Dalton did considerably well for a 24 weeker, but he did not escape the NICU unscathed. Dalton was in the NICU for 4.5 months before coming home. As for lasting effects from his prematurity, Dalton has had problems with aspiration and has been placed on thickeners to help him swallow. He has a highly sensitive gag reflex and mild oral aversion (unable to tolerate certain textures). Dalton has asthma, but escaped without Chronic Lung Disease (very common in micro preemies). He has “Extreme Far Sightedness” that is hereditary and unrelated to his prematurity, but is affecting his already delayed development. Dalton has just recently been diagnosed with Spastic Diplegic Cerebral Palsy (mostly effecting his feet and legs). He also has Ataxia (tremors in his hands when grasping an object). He is wearing braces on his legs and receives occupational and physical therapy at home twice a week. Dalton can say “momma”, “bye bye”, and is babbling and chattering like crazy. 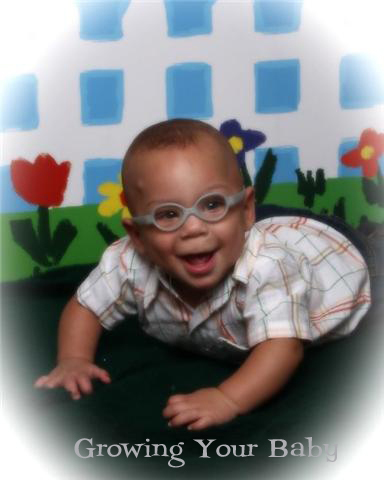 He is crawling better now, but is still unable to sit independently due to his high muscle tone. He is pulling up on furniture but is not walking on his own yet. He is 17 months (13 months corrected). If Jo had one piece of advice for a new preemie mom, it would be this: Self educate, be protective. Read the Essential Handbook for Parents of Premature Babies. What a perfect word for a former 24 weeker who fought for life in the NICU!!! If you would like to read more about this warrior, you can go here to Pray For Dalton.